The Museum of Science and Industry, Chicago is one of the world’s largest science museums, with more than 400,000 square feet of unique and imaginative exhibits. Founded in 1933, the museum is “dedicated to inspiring the inventive genius in everyone with uniquely interactive experiences.” So much more than your typical science museum, MSI wants to bring real moments of discovery and education to each and every visitor, creating experiences they’ll never forget. While the museum does work to educate and inspire children and get them excited about science, it appeals to people of all ages, with breathtaking exhibits, rides, and simulators that will capture your interest and pique your curiosity. If you’re looking for a unique Chicago event venue, The Museum of Science and Industry is the perfect choice. Located in the Hyde Park neighborhood, near Lake Michigan, it is close to downtown and event rental packages include underground direct-access parking, making it convenient for guests. MSI was named the “best special event venue of the year in Chicago” by EventUp.com, and it is one of our favorite event spaces in Chicago. If you’re interested in hosting your next corporate event, meeting, gala, or awards dinner at the Museum of Science Industry, On The Scene will be your behind-the-scenes partner. MSI is a huge venue, with a variety of event spaces, so you’ll need a knowledgeable and experienced team to produce your event and guide you in the right direction. The On The Scene team has produced several special events at MSI, and we have worked with the MSI staff to create one-of-a-kind experiences. Our familiarity with the venue allows us to choose the right space for your event, and work with you to ensure the decor, design, and overall experience matches your corporate culture, brand, and goals. 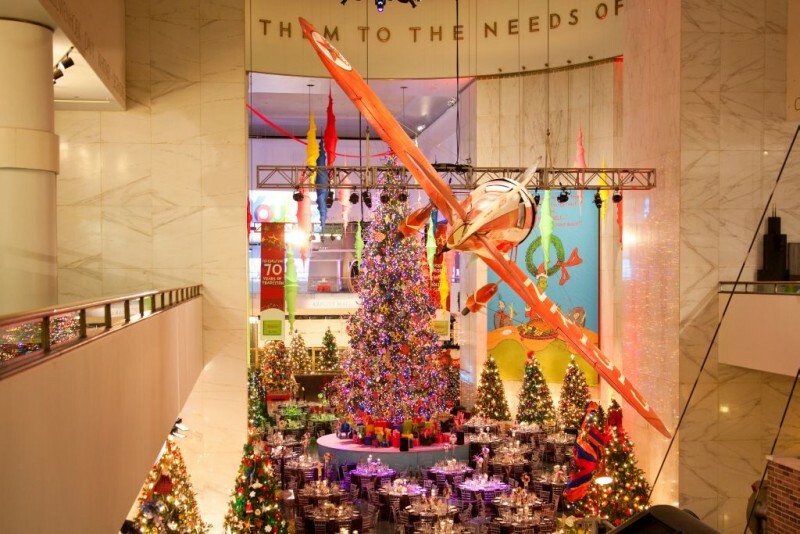 If you’re looking to add an interesting and innovative twist to your event, The Museum of Science and Industry offers 12 unique event spaces that are ideal for a wide range of events. No matter the type of event or the number of attendees, MSI has a space that is perfect for your company’s upcoming program. The Rotunda (12,000 seated guests; 5,500 standing) – Featuring a 120 ft copper-domed ceiling, and the “tornado” exhibit, the Rotunda is perfect for a unique twist on larger corporate events, such as seated formal dinners. U-505 Submarine (200 seated; 700 standing) – A one-of-a-kind space, the submarine is perfect for both a seated dinner and reception. Entry Hall (600 standing) – With high ceilings and plenty of space, the entry hall is a great setting for a cocktail hour, welcome entertainment, or event check-in. Smart Home (40 seated indoor guests; 100 indoor standing; 300 outdoor standing) – The MSI’s newest private event space offers the feel of an intimate event hosted at your home. South Portico (1,000; 1,500 tented) – This outdoor space overlooks the Jackson Park Lagoon and is great for a large summer event. North Portico (1,500 tented) – The front lawn of the museum, North Portico offers plenty of space for a tented event, or you can set up an elegant entranceway for a more formal corporate dinner, fundraiser, or gala. Omnimax Theater (300 seated) – This large theater features a giant screen, making it the perfect space for presentations and meetings. Auditorium (main level – 649 seated; balcony – 200 seated) – The auditorium is ideal for concerts, performances, presentations, speakers, and awards ceremonies. Little Theater (200 seated guests) – A smaller theater space, the Little Theater is complete with a stage, podium, and A/V equipment, making it perfect for company meetings, presentations, and panels. West Pavilion (Main floor – 300 seated; balcony – 200; classroom – 120) – With two levels, this event space can serve many functions and can accommodate a variety of events. Rosenwald Room (100 seated guests; 100 standing; classroom – 80; theater – 130) – With A/V capabilities and wifi, this space can be set up in a variety of ways, from classroom seating to lectures to meetings to corporate luncheons. Henry Crown Space Center (150 seated guests; 300 standing) – With a variety of space exhibits, the space center provides a unique atmosphere for your corporate dinner, cocktail hour, or meeting presentation. If you’re hosting a large-scale event with thousands of guests, the entire museum is available to rent, and can comfortably accommodate up to 12,000. 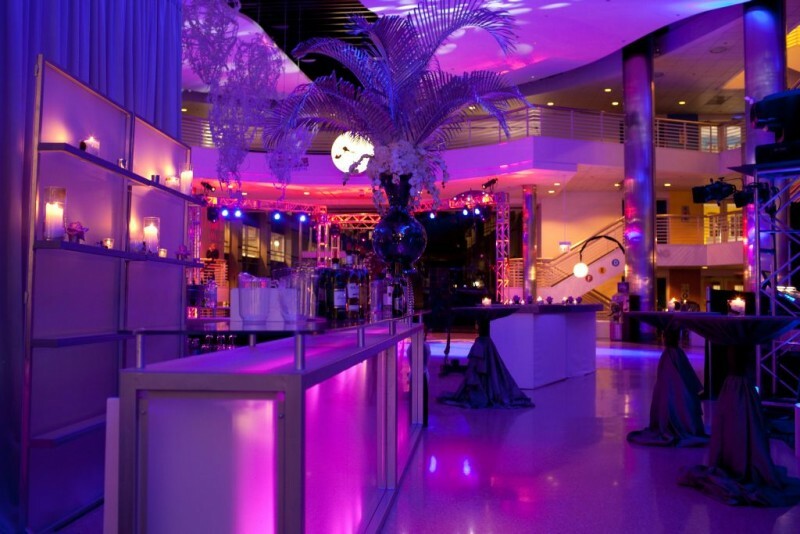 As Chicago’s top event management company, On The Scene has years of experience producing stand-out corporate events for a variety of clients in a wide range of industries. We become an extension of your team, working closely with you to produce a stand out event experience that guests will remember for years to come. If you’re considering hosting your next event at The Museum of Science and Industry, and need assistance with the planning, logistics, implementation, and production, contact On The Scene today!